People regularly ask to come visit our cattery. We appreciate the interest in our cats and really enjoy the visits, however we ask that you please take the time to fill out our kitten questionnaire on the website first. A visit to our cattery is, in effect, a visit to our home. We'd like to know a bit more about you and, if possble, what type of kitten you are hoping for so that we can plan to show you reference studs and queens and discuss upcoming breeding plans with the goal of helping you decide on a kitten. To schedule a visit, please complete and submit our Kitten Questionnaire with a note in the comments section requesting a visit. Please also provide some dates and times that are convenient for you and we will do our best to find a time that fits within both our schedules. We work and have children so visits must be planned ahead and often have to fit in around family obligations or brand new litters of kittens that keep us very busy. We thank you in advance for your patience and understanding. Please note that visits with the kittens themselves are strictly reserved for those on the reservation list who are coming to visit their kitten after its 8 week vaccinations. Below: our maternity/birthing rooms. These rooms are all within our home so that we can keep a close eye on the queens and kittens at all times. Being raised in a home environment is imperative to great socialization, and ensures the kittens grow up with all the sights and sounds (ok, noise!) of a busy, active family and household. We keep the queens and kittens in a secure and safe environment until the kittens are old enough to explore the house and play underfoot at about 5 or 6 weeks of age. Below: Heated/air-conditioned housing with year round outdoor access via cat doors to large safe outdoor enclosures. This is where the studs and some of our queens spend are housed when they are not in the house with us. Studs must be housed separately at all times because of spraying and the risk of unplanned mating so we make their homes as interesting and comfortable for them as possible with year round outdoor access through their individual cat doors to safely enclosed outdoor recreation areas. Cat Boarding for Kitten Clients! Enjoy your long weekends and vacations away without worrying that your bengals are not being entertained or well taken care of. We offer boarding at $25 per night/per cat or $40 per night/per pair of cats for kitten clients who want to leave home for a weekend getaway or an extended family vacation. 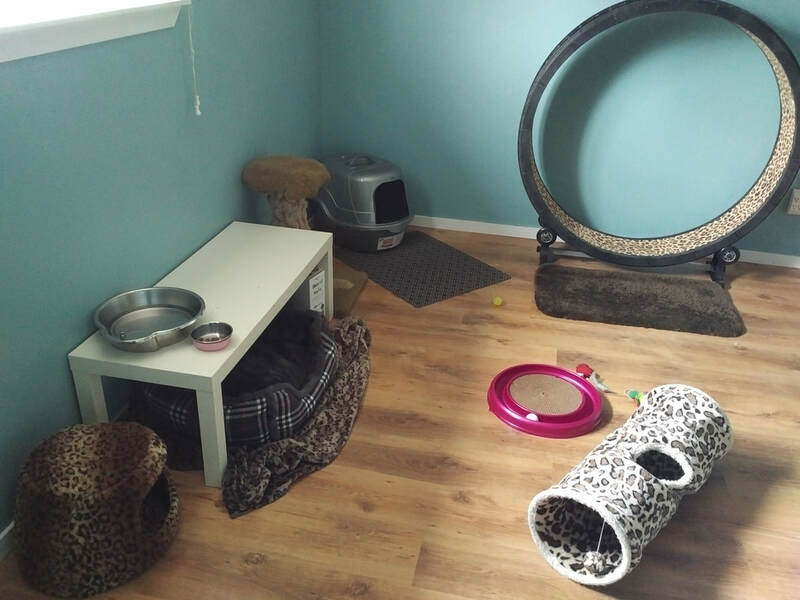 We will keep your cat(s) in a safe enclosed space with a running wheel and cat tree within our home where they will be treated as one of our own. You are welcome to send along your cat's favourite items - beds, scratch post, blanket, toys, etc. Just bring your cat's food and favourite things and we will supply the care and love while you are away. We offer reduced rates for extended stays - please enquire.